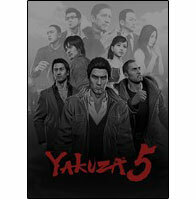 The epic story of Kazuma Kiryu, the former Dragon of Dojima, continues in Yakuza 5, coming to PlayStation 3 in Fall 2015. © SEGA. All rights reserved. SEGA, the SEGA logo and Yakuza are either registered trademarks or trademarks of SEGA Holdings Co., Ltd. or its affiliates. The "PS" Family logo and "PS3" are registered trademarks of Sony Computer Entertainment Inc.